กำชัย ทองหล่อ. หลักภาษาไทย. กรุงเทพฯ : บำรุงสาส์น, 2533. นันทนา รณเกียรติ. สัทศาสตร์ภาคทฤษฎีและภาคปฏิบัติ. กรุงเทพฯ : สำนักพิมพ์มหาวิทยาลัยธรรมศาสตร์, 2548. ISBN 978-974-571-929-3. Gandour, Jack, Tumtavitikul, Apiluck and Satthamnuwong, Nakarin.1999. “Effects of Speaking Rate on the Thai Tones.” Phonetica 56, pp.123-134. Tumtavitikul, Apiluck, 1998. 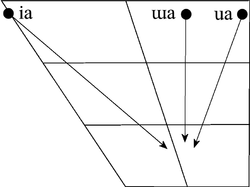 “The Metrical Structure of Thai in a Non-Linear Perspective”. Papers presentd to the Fourth Annual Meeting of the Southeast Asian Linguistics Society 1994, pp. 53-71. Udom Warotamasikkhadit and Thanyarat Panakul, eds. Temple, Arizona: Program for Southeast Asian Studies, Arizona State University. Apiluck Tumtavitikul. 1997. “The Reflection on the X’ category in Thai”. Mon-Khmer Studies XXVII, pp. 307-316. Tumtavitikul, Appi. 1995. “Tonal Movements in Thai”. The Proceedings of the XIIIth International Congress of Phonetic Sciences, Vol. I, pp. 188-121. Stockholm: Royal Institute of Technology and Stockholm University. Tumtavitikul, Apiluck. 1994. “Thai Contour Tones”. Current Issues in Sino-Tibetan Linguistics, pp.869-875. Hajime Kitamura et al, eds, Ozaka: The Organization Committee of the 26th Sino-Tibetan Languages and Linguistics, National Museum of Ethnology. Tumtavitikul, Apiluck. 1993. “Perhaps, the Tones are in the Consonants?” Mon-Khmer Studies XXIII, pp.11-41. หน้านี้แก้ไขล่าสุดเมื่อวันที่ 31 มีนาคม 2562 เวลา 07:16 น.